When I moved to Point Reyes Station in 1975, the town’s postmaster was a short, thin, friendly man named George Gallagher. His identical twin Bob ran North Bend Ranch just east of town along the Point Reyes-Petaluma Road. Sadly, that historic ranch is now for sale. Scott Stevens of Leading Edge Properties two weeks ago told The San Francisco Chronicle the 300-acre ranch is listed for $5.5 million. The ranch got the name North Bend because Papermill Creek makes a northward-pointing arc as it crosses the property. In 1913, the twins — who both died in 2002 at the age of 89 — were born on the ranch, which their grandfather bought from the Shafter family in the 1870s. The old Gallagher house is unoccupied but is now being cleaned. Photos by Leading Edge Properties, (707) 695-4448. Bob and George grew up in a white, two-story Victorian house, watching the North Pacific Railroad’s narrow-gauge trains rumble through their front yard, sometimes hopping aboard for a trip into San Francisco. “There’s something about a train — you can live right by it every day, and still when one comes by, you can’t help looking up,” Bob Gallagher recalled in a Point Reyes Light interview 11 years ago. The cattle-feeding barn with the ranch’s old barn at right. The Gallagher children weren’t the only ranch residents who had to be careful. Sometimes turkeys and cows got dangerously close to the tracks while foraging in the right-of-way. George Gallager (left) and Bob Gallagher in 1997. Bob told of a time when a young ranch dog followed him and George as they ran across the tracks to beat a speeding train. The twins made it across safely, but the dog disappeared under engine. However, after the train had passed, the dog — which had crouched under the cars — got up and was able to walk away although it no longer had a tail. The trains made it possible for the Gallaghers to take quick trips into San Francisco. Both Bob and George fondly remembered playing cards on one trip with Jackie Coogan, the child actor whose well-known roles included starring with Charlie Chaplin in The Kid. As it happened, Coogan had a grandfather in West Marin whom he frequently visited. It was easy to catch the train as it ran through their ranch, Bob and George noted. “You’d just wave down the conductor, and he’d stop and give you a toot-toot,” George said. The brothers would then board the train and ride it to Sausalito, where they would transfer to a Northwestern Pacific ferry. They’d reach Fisherman’s Wharf in about 90 minutes — less time than it takes most commuters today. The main ranch house, where Kevin and Katie Gallagher live, was built in the 1960s and has three bedrooms. There is much more that could be said about the ranch. • To the south, it borders on federally owned land within the Golden Gate National Recreation Area. In the 1980s, the GGNRA’s boundaries were extended to include North Bend Ranch. This means the Park Service has Congressional permission to buy the property; however, the Park Service hasn’t had the funds to do so. The Park Service has also discussed extending the Cross Marin through the ranch, and on Oct. 14, 2001, bicyclists took a trial run. But nothing has come of that idea either. • Another government agency, North Marin Water District, has a well on the property. It’s one of several wells along Papermill Creek for the water system that serves Point Reyes Station, Olema, and Inverness Park. • The Gallagher family hadn’t wanted to sell the property but needs the money to help pay for retirement and medical bills, real estate agent Stevens told The Chronicle. The owners of the ranch are George Gallagher’s sons Kevin and Paul, along with Bob Gallagher’s son and daughter Dan and Maureen. Great story about the Gallagher brothers and how the train was interwoven into their lives. You can almost hear the whistle and the sound of the train on the tracks. I’m not sure I ever spoke with them when I lived out there. 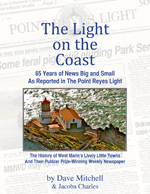 But I would see them around town and could tell they held so much history of Point Reyes. Whatever goes in there after the ranch is sold will never replace what came before, that’s for sure. Sparsely Sage and Timely is powered by	WordPress 4.9.10 and delivered to you in 0.473 seconds using 56 queries.